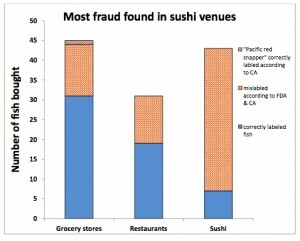 Tests on seafood sold at Los Angeles-area sushi bars, other restaurants, and grocery stores show that more than half is incorrectly labeled, a nonprofit organization that advocates for ocean protection said Tuesday. DNA testing carried out by Oceana confirms that 55 percent of the seafood sampled was mislabeled, according to an Oceana statement. A chart from Oceana's report. In May and December of 2011, Oceana staff and supporters collected 119 seafood samples from grocery stores, restaurants and sushi venues in Los Angeles and Orange counties, the group said. The targeted species included those that were found to be mislabeled in previous studies as well as those with regional significance, such as wild salmon, Dover or other regional soles, red snapper, yellowtail and white tuna, the statement said. – Eight out of nine sushi samples labeled as ‘white tuna” were actually escolar, a species that carries a health warning.